The American League Playoffs get underway on Wednesday with the Wild Card Game between the New York Yankees and Oakland Athletics. This will be the third time in the last four years that the Yankees are hosting the Wild Card Game. They are 1-1 in those games, losing to the Astros in 2015 but knocking off the Twins and eventually reaching the ALCS last year. Oakland, meanwhile, hasn’t been to the postseason since they claimed a wild-card spot, only to lose a heartbreaker in 12 innings to the Royals in the Wild Card Game. 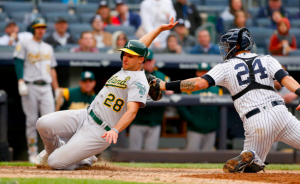 It feels like the Yankees and A’s have been on a crash course to meet in this game for weeks. However, at the start of the season, few would have predicted seeing this matchup in the American League Wild Card Game. Many presumed the Yankees would win the AL East on their way to something greater. Meanwhile, the A’s were considered by most to be an afterthought in the playoff picture. It will be interesting to see if the difference in preseason expectations plays a role in either team’s mental approach to a win-or-go-home situation. Despite winning over 90 games this year, the A’s may feel like they’re playing with house money. The Yankees, meanwhile, won 100 games and could feel a little extra pressure not to have their season end in a one-game playoff after such an impressive regular season. After much debate, Yankees manager Aaron Boone decided to start Luis Severino in Wednesday’s game. On the season, Severino was New York’s best starter, going 19-8 with a 3.39 ERA. He will also have more than a week of rest in between starts, so he should be fresh and ready to go. However, Severino had some struggles down the stretch, including a start against the A’s in which he gave up six runs (five earned) over 2.2 innings. Nevertheless, Boone believes he gives the Yankees the best chance to win. The A’s will take a different approach to the Wild Card Game, giving the start to relief pitcher Liam Hendriks as the team’s “opener.” The Australian native served as Oakland’s “opener” eight times in September, posting a 2.08 ERA over 8.2 innings. Overall, Hendriks posted a modest 4.13 ERA on the year. Of course, he’s likely to pitch only an inning or two. Who the A’s send to the mound after that is anybody’s guess. However, Oakland’s bullpen is one of the deepest in baseball. The A’s have more than a handful of reliever they could trust for at least an inning of work, and they will look to ride that bullpen to the ALDS. While Oakland’s bullpen figures to take center stage in this game, New York’s bullpen may be the biggest X-factor. On paper, the Yankees have four relievers with experience as a closer. In theory, that should allow them to hold onto any lead they have beyond the 5th inning. However, Aroldis Chapman has only had a few appearances since returning from the DL. Dellin Betances and David Robertson have both had some hiccups in September. Given the power in Oakland’s lineup, the bullpen could be vulnerable if those guys aren’t on top of their game or if Boone gets the matchups wrong. On the other hand, New York’s relievers can be dominant and may be able to help the Yankees seal the deal if Severino can leave the game with a lead. The Yankees will definitely feel the pressure of the moment in this game. But I think they’re well prepared to handle it. The Bronx Bombers have been in this spot before, and that experience should pay dividends. Meanwhile, the A’s are likely to use at least half a dozen different pitchers, which could be tough to manage from inning to inning. Boone should have a good idea of how he wants to manage his pitching staff, and ultimately, I expect the Yankee bullpen to shut the door. New York wins 5-3.